Even though I got new PCBs in June, I previously had set a “1CC Ketsui in June” goal for myself so I didn’t spend much time with them. June is over, so did I meet my goal? Unfortunately, no. I got very close and I’ll continue the chase soon, but I had to take a break. I didn’t touch shmups for about a week or so. I had played a few credits of Mushihimesama and gotten a feel for the different modes. I found Original mode to be pretty easy, in fact the first time I ever played the game I was able to get to stage 4 on one credit and soon after was reaching stage 5. But again, due to my prior commitment I didn’t put much time into it. Tonight I decided to ease myself back into playing and threw Mushihimesama in the Astro City. 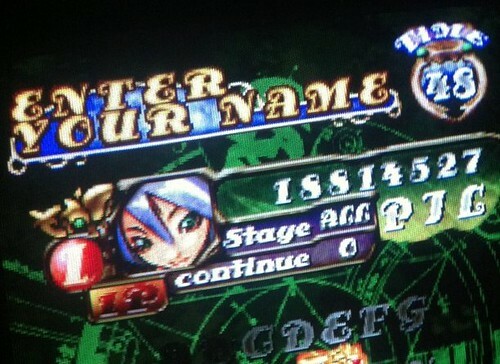 On about the 4th credit of Original mode I played, I was able to pull off the 1CC!